It’s that time of year again, folks! A little more than two months until Dragon*Con! 71 Days. This of course means time to get serious! 1 – A Tentative Costume List – This is the one that absolutely changes the most! Things have to be made, costume pieces are scattered about and it’s hard to find all of the pieces, group photoshoots, you don’t fit a costume anymore…All kinds of factors can change the list in a heartbeat! 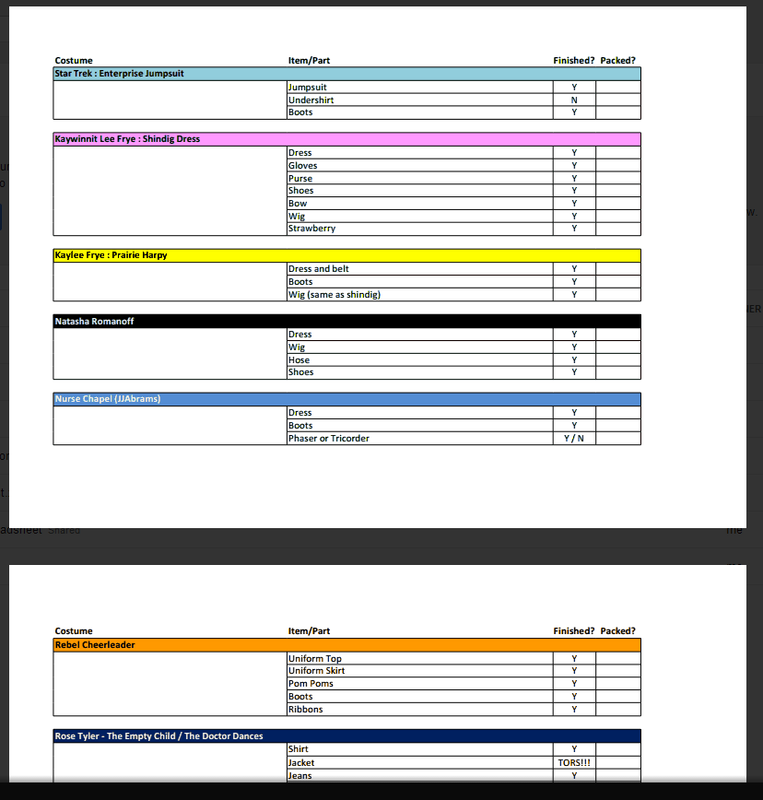 The way I format my costuming list has every piece and accessory needed for a costume, whether or not it is finished, and then finally whether or not it is packed. I think this format is the most handy and ensures that you don’t leave something behind! 2 – A Tentative Schedule – That’s right, I like to stalk all of the fan tracks and try to figure out WHAT to do – what I want to do, what I have to do, etc. Like this year for example, I’m supposed to be on a couple of panels so I have to find that out ASAP and plan accordingly. Also there are set photo op times with celebs so you have to plan around those, too. This is another one that can change abruptly because let’s face it – sometimes you lose track of time at D*Con because of all of the fun you’re having, so you just forget to go to something..
* A side note about my schedule, I WILL schedule times to go eat something each day because frankly it’s dumb to skip meals – even at Dragon. 3 – Room Deposits – If you are the room holder for your group, this is CRUCIAL!!! I keep a running tally of what each person has paid me for their share of the room. I let them pay in increments as they can, with a deadline of August 1st. This way people have time to pay and they risk losing their spot if they don’t cough up the dough. And also that way no one gets overcharged because I have an accurate running total with formulas in the spreadsheet calculating what their remaining total is. While this one doesn’t change that often, I feel like it is one of the most important spreadsheets. Now one may think that with ALL of these spreadsheets, how can anyone focus on the fun of D*Con? It’s actually not that difficult. The costume list gets chucked once everything is packed and ready to go! That puts me at 2. Everyone should have paid their share of the room by the time I get there so that cuts out another one. That only leaves me with the schedule which I usually just print out and go from there. And I stray from that schedule quite a bit. I use categories like “MUST GO”, “Want To Go”, and “Maybe Check Out”. It’s easy. And color coded. It fits my OCD quite well! Another fantastic idea to help stay organized with groups and what not is Google+ on your smartphone! You can chat with certain people and figure out where events have moved to, what time, etc. Things get hectic and they change all of the time at the con. I hope some of these tips and tricks help some of you out and help make your Pre-Dragon*Con experience a little LESS stressful! Remember, we’re all there to have FIVE AWESOME DAYS OF FUN! See you all there!